Shrine of the North American Martyrs in Auriesville. In our Catholic tradition, a “Eucharistic Congress” is a special gathering led by the bishop focused on our Lord Jesus in the Eucharist. It is a time of joy, fellowship, prayer, and unity. This will be a time of spiritual renewal for our whole diocese. All Catholics in the diocese are invited to attend. 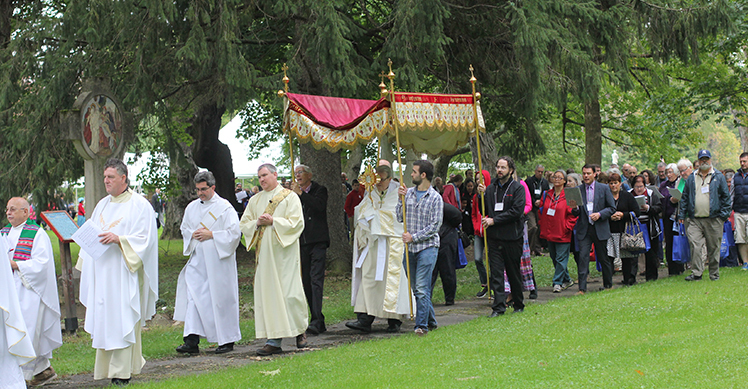 Parishes are strongly encouraged to organize groups to travel to the event. 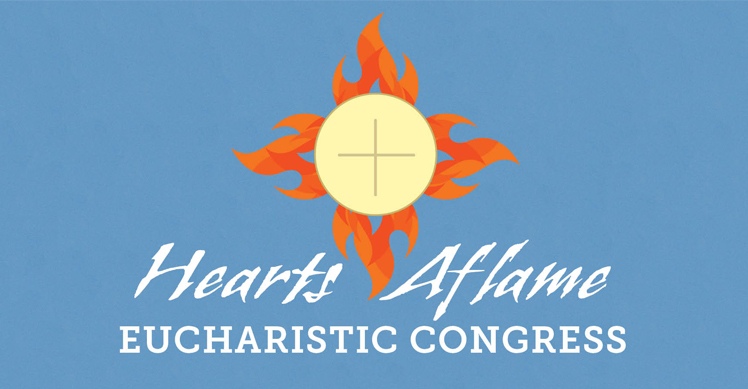 Hearts Aflame is a free event open to all; there is no cost to attend. Lunch will be available for purchase or you may bring your own. Lunch orders must be in by Friday, Sept. 14. Online registration is now closed. Walk-ins welcome. Check in at information table. Please bring a lunch, as lunch orders are now closed. Hearts Aflame is being held at the “spiritual center” of our diocese, the Shrine of the North American Martyrs in Auriesville. The Shrine is a beautiful 600-acre property situated on the banks of the Mohawk River. It commemorates the martyrdom of three Jesuit missionaries, as well as St. Kateri and other heroes of the faith who impacted this part of the country. In addition to the stupendous 1930s-era coliseum, where the main Mass will be celebrated, there are numerous chapels and prayer-paths that visitors have enjoyed for decades. The beautiful location is just one more reason to attend Hearts Aflame! If you live in the Diocese of Albany and have not visited the Shrine, this is a tremendous opportunity to be inspired! Arrival & Onsite Registration. Shrine grounds open for the event. You are welcome to explore the Shrine grounds until closing at dusk. *All times are approximate. Announcements will be made throughout the day about logistics. Please follow the instructions for the Eucharistic Procession at the conclusion of Mass.